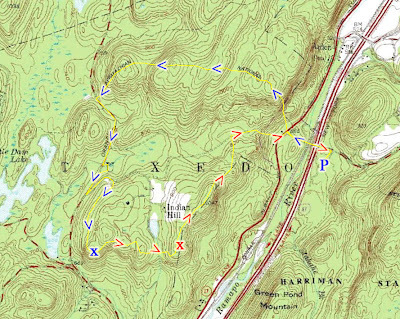 We started at the Elk Pen in Harriman State Park. We parked there and took Arden Valley Road together with the AT, and headed east across the Thruway, then crossed over Route 17, and continued up the AT over the Agony Grind, which is a steep ascent skirting large boulders. 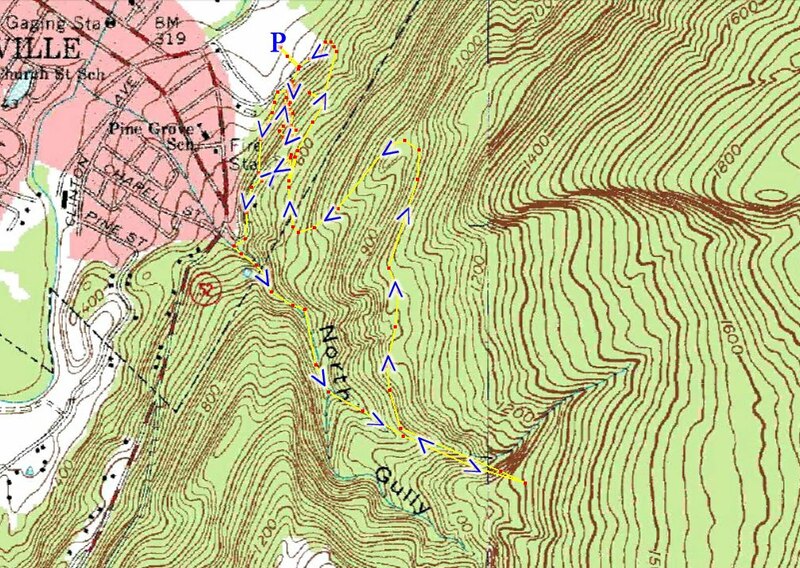 We had attempted to take the blue-blazed connector trail to the Indian Hill Loop, but went too far ahead along the AT, so we changed course and decided to continue along the AT towards Orange Turnpike. On the way right before the ascent towards the road is an excellent rock viewpoint with fantastic views north, west, and south. At the junction with Orange Turnpike, we went along the side of the road, passed a spring, and continued to the dirt road to the parking area of the Indian Hill Loop Trail. From there we headed south along the Indian Hill Loop, and picked up the adjoining Furnace Loop Trail as it goes concurrent with the Indian Hill Loop. Continued along the Indian Hill Loop, and instead of going back towards the AT, we bushwacked east at the stream steeply down towards Route 17, which ended up right near Arden Valley Road. This was a much appreciated shortcut that saved us lots of time. View from atop Agony Grind. Facing south with the Thruway cutting across. (the Elk Pen is the meadow in the left). View descending the AT towards Orange Tpk. This is a large exposed rockface. The view at the intersection of the Indian Hill Loop and the Furnace Loop. Me at the above view. Facing North from Indian Hill. too lazy to figure it out using my mapping tools. This was quite an interesting hike, not by choice. It was about 9:30 at night when I received a call from Chaverim, a help organization, that they needed my help for a search and rescue mission. A family with seven members had gotten lost on a hike and it had already gotten dark, and they needed my help locating them. 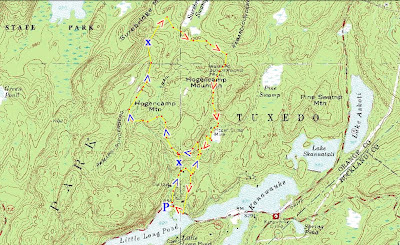 The lost individuals had provided some details as to his whereabouts, and based on his description, I had determined the location to be at the intersection of the Pine Meadow Trail and The Conklin's Crossing Trail. There was no way to ascertain that for certain, since communication with the people were lost when the one cell phone they had its battery die. I had already taken a solid hike in the morning, so this was my second hike of the day. The Chaverim members picked me up, and I suggested we park at the end of Wilder Road by Route 202. This was an out of the way parking space, as We wanted to stay as inconspicuous as possible so that we would not be detected and stopped by the Police, who would have blown this into a huge deal. Our group headed south down Route 202 for a little bit, then bushwacked into the Wood and crossed the Mahwah River to get to the Sherwood Path. It was pitch black, with no moon at all. We all had flashlights and headlamps, and this guided us throughout the way. At one point we took a wrong spur off the Sherwood Path, but then found it again. While climbing the Sherwood Path up Horse Stable Mountain, we head a bunch of ATV's at the bottom and saw the lights in the distance. Apparently someone had called about us and they were searching for us. We shut off our flashlights and kept quiet until they passed. 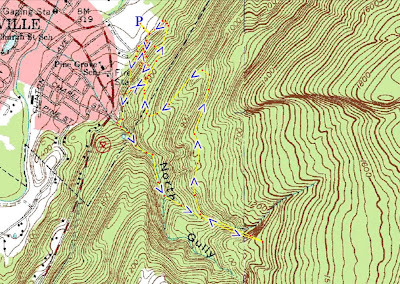 We continued along the Sherwood Path, which is a pretty good uphill climb, and two Chaverim members couldn't make it any further so they bailed out by the shelter at the Suffern-Bear Mnt Trail intersection. We continued until the Pine Meadow Trail, and then went south on the Pine Meadow Trail towards the lake. I was hoping and praying that we'd find them there. As we came closer to the lake we started yelling and blowing whistles, and low and behold, we heard a response! We found the missing people! They were grateful to see us, and heartily devoured the food and drink we provided them. 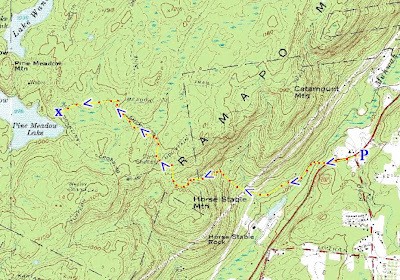 Here is how they got lost: They had started at the Pine Meadow Trailhead at the Horse Stables at 6:00 PM, and planned on heading towards the lake. They didn't realize how long it would take to get to the lake, and when it took them 2 hours and they were at the lake and it got dark, they realized they had a big problem. They didn't have any flashlights and were not very familiar with the route, and they just stayed put until we came to rescue them. After the exciting moment of meeting up with them, we turned around, designating someone in the front and someone in the back (to make sure everybody was accounted for at all times), and headed back. We picked up our two members at the shelter and continued down along the steep trail, and then went back to the cars. This was a real muggy night and I came home soaking wet through and through. I took a good shower, and went straight to bed. I have been to the Sterling Ridge Fire Tower several times but the Fire Tower is always closed off. I think this was my first time there during the summer when it was open. We parked on Sterling Lake road right by the Sterling mine and took the short Sterling Mine Trail through the mine dumps and shafts and abandoned buildings. From there we took the Fire Tower Connector Trai trail until the Fire Tower Trail, all the way up the Fire Tower. 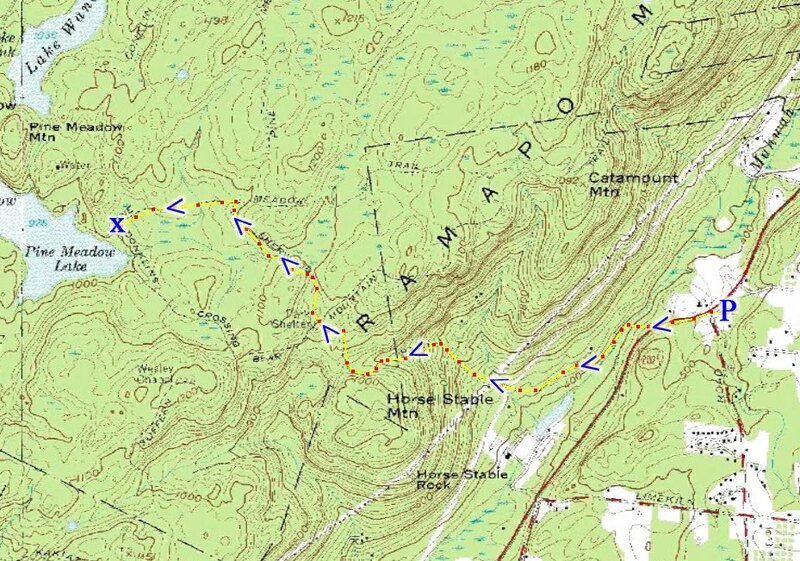 This is a very easy two lane trail, and although the climb is good it is not steep at all and gradual. We climbed up the Fire Tower, took some pictures, and then continued along the Sterling Ridge Trail north past some views and the Power Lines, and a little further by a stream we bushwacked down near the stream to the Sterling Valley Loop Trail. From there continued along until the lake and then continued along the road back to the car. The top of the Fire Tower. Looking north at Sterling Lake. Sterling Lake from the Fire Tower. Yehuda on the top of the Fire Tower. Looking west from the Fire Tower. Me Looking Down from the Fire Tower. A Giant Fly we saw at the Fire Tower. This fly was the size of a large bumble bee. Sterling Lake from the view on the Sterling Ridge Trail. I was staying in the Catskills area when I took this hike. 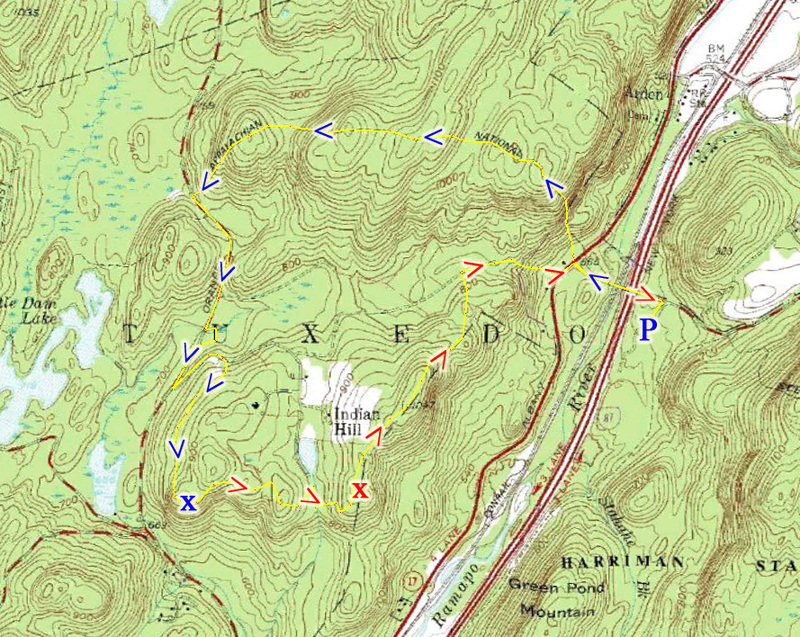 Our plan was to go through the old Ellenville Quarry and then head to the lower Ice Caves (Ellenville Ice Caves). Unlike the other Ice Caves near Sam's Point, the Ellenville Ice Caves are by permit only and lack and official trail. We had parked at Berme Road Park in Ellenville, and first started exploring the old quarry. We found a few good quartz crystal points and some small pieces of Pyrite. We had climbed to the top of the quarry and bushwacked around to find many small exploratory pits which yielded some more small quartz crystal points. 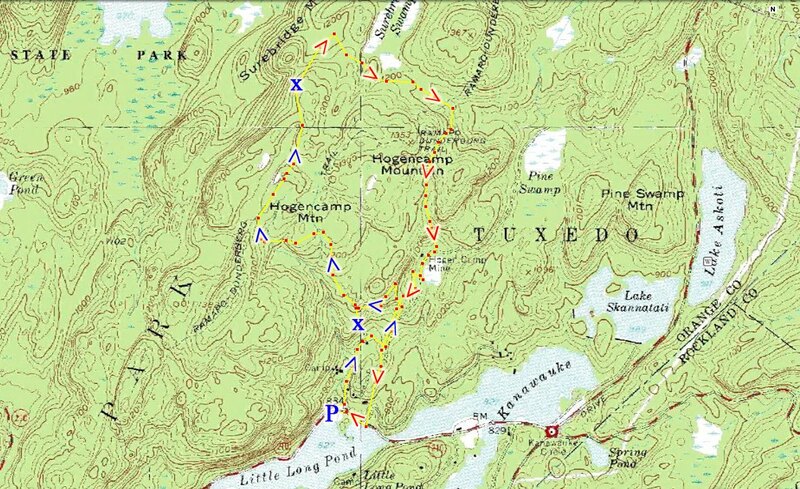 We had then headed back down, and looked for the road path listed on the NY/NJ Trail Conference map of the Gunks that goes behind the Route 52 to the mouth of the North Gully. Now the map is very incorrect here and this road doesnt exist, and when we tried bushwacking were barked at by some nasty sounding hounds, so we bushwacked up the steep hill until we encountered another path not on the map. We first took this path north, which veered off onto private property, so then we turned around and headed south towards the North Gulley, where this path ended. North Gully starts with a beautiful waterfall with a nice size drop, and there is a path going up the first part of it. We took this path up past the top of the waterfall and continued along past some very interesting potholes, and then the path slowly got more and more overgrown until it has just simply disappeared, at which point we just turned around, and took a side route off to another unmarked path which took us back near the top of the mines near Ellenville. At this point it was already getting late and we gave up on the Ice Caves for another day. Continued back on this path eventually hitting the Smiley Carriageway, and then took this back to the car. North Gully Falls from the side. very low due to lack of rain over the summer. Water flowing through the solid rock bed in North Gully.